My cousin, Molly, is lucky to be alive. I don’t remember exactly how old we were, but I’m going to say ten, eleven, and twelve–Andy the oldest, Molly the youngest, me right in the middle. Growing up on the farm, the three of us were peas in a pod (I couldn’t resist! ); designations like “sibling” and “cousin” meant nothing to us. Together, we were brilliant inventors, intrepid adventurers, best friends. We explored, charted, and touched every inch of that farm, and I’m sure if you look closely, you can still see the marks we left behind. Me, I don’t even have to look closely. All I have to do is close my eyes and I can see them perfectly, as if no time at all has passed. So this one day, Andy suggested we build boats to sail across the Upper Pond. I don’t actually remember if it was Andy’s idea, but I’m assuming it was. He always had the riskiest ideas. First, you need to understand something about the Upper Pond. When it was constructed in the 1950’s–one of three irrigation ponds on the farm–it was a pristine masterpiece, a gravel oasis stocked with bass and bluegill, filled to the brim with fresh, clear water. Then thirty-five years passed, and it became a wild, weed-choked mud wallow, its murky depths the stuff of nightmares. Despite the old photos we’d seen showing gleeful farmhands splashing in its sparkling waters, my cousins and I had never dared set foot in it. The Upper Pond was scary. 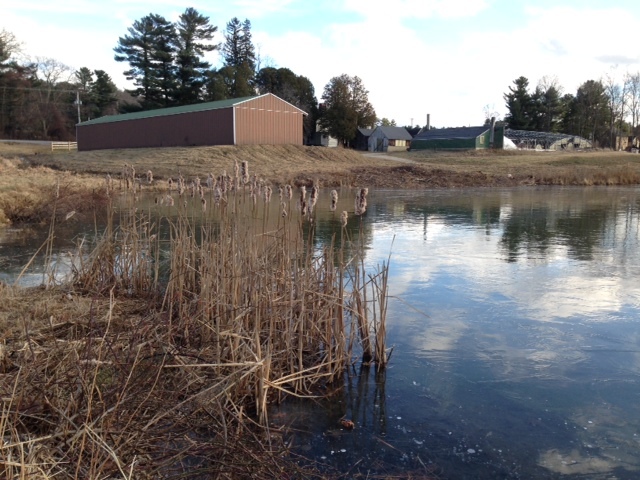 Just up the hill from the Upper Pond sat our grandfather’s tractor shed. It was a long, brown, corrugated steel structure, home to four tractors–a pair of Fords, a John Deere, and a Kabota–barn swallows without number, and our holy grail: Grandpa’s workshop, with its wooden benches; herds of sawhorses; boxes of nails and bolts and screws; tool racks hung with pliers, wrenches, hammers, and saws; bags of seed stacked in the corners; gas cans milling about the door; and there, beneath it all, the smell of sawdust and oil and earth. I’ve never been anywhere else that smelled exactly like it. 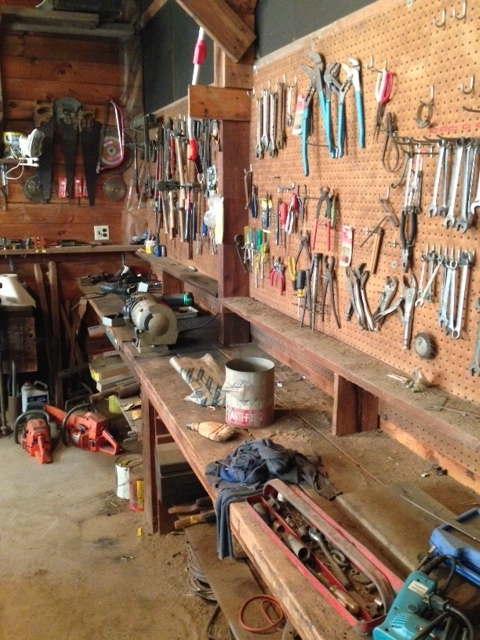 It’s strange–I have no memories of Grandpa working in his workshop (he was too busy in the fields, I guess)–but that didn’t stop Andy, Molly, and me from putting it to excellent use. It became our workshop, our laboratory, our think tank, and on this particular day, our dry dock, too. We pillaged the scrap wood pile, searching for perfect keels and masts, and it was soon apparent that while Molly and I were on the same page, laying out the pieces to our fine model sailboats, Andy had other plans. BIG plans. His boards dwarfed ours, and the sheet of plastic he’d cut from the leftover bolts of greenhouse sheathing was enormous–a king-sized bed’s worth, at least. Molly and I were intrigued, but despite our pleas, Andy wasn’t revealing his design. We’d just have to wait and see. I can’t say how long the construction process took. It might have been a few hours, or it could have lasted a few days. That’s the beauty of childhood: time doesn’t matter. You don’t worry about things like schedules or deadlines. You simply create, deftly wielding your imagination while time melts away around you. Then, without even realizing you were gone, that you’d been lost in some make-believe world, you snap back to reality, look down, and see that your boats are built, ready for their maiden voyage. I was proud of my effort. I really wish I had a picture of it somewhere. (More on that in a minute.) The design was simple: I nailed two boards into the shape of a cross–the longer of the two (five feet, I’d estimate) served as the keel, the shorter (four feet, perhaps?) as an outrigger. We’d found some old styrofoam seed flats in the greenhouse, which I glued to the underside of both keel and outrigger for buoyancy. A long wooden stake, held fast with guylines of twine, was my mast, while I’d fashioned a sail out of the same greenhouse plastic Andy had used (albeit a much smaller piece). Andy’s craft had taken shape, too. Not content constructing a model boat like us kids, Andy had built an actual boat, complete with crude scrap wood oars, fully intended for human passage. Looking back now, it was little more than a rickety, oblong frame, the greenhouse plastic wrapped around it, forming a precarious hull. At the time, though, Molly and I thought it was the Titanic reimagined, a luxurious ocean liner compared to our little toy dinghies. We lugged the boats down the hill from the workshop to the shore of the Upper Pond. Andy needed help maneuvering his through the tangle of cat-o-nine tails at the water’s edge and by now, a small audience (okay, it was really just Andy and Molly’s step-mother, Michelle) had gathered to witness the christening. Molly and I took turns scooting our boats out onto the water, where they lolled and bobbed like so many pieces of flotsam, adrift on the current, slave to the breeze. We all oohed and aahed in appropriate measure–at least the things floated–but what we really wanted to see was the S.S. Andy’s sea trial. Andy’s boat twisted and torqued as he slipped it into the water for the first time, and almost immediately, it began to leak. That’s what happens, I guess, when you use staples and nails on a plastic hull rather than rivets on steel. Then, Michelle said something that made a whole lot of sense to Andy and me: “Molly, get in for a sec. See if it holds you.” Sometimes she had the riskiest ideas. It required more than a little goading, I recall, before Molly finally stepped into Andy’s boat, a look of mild distress written on her face as the water continued to blub blub blub up from the dark abyss that was the Upper Pond. Michelle was laughing by now. “Oh my god!” she said. “I have to get my camera. Stay here!” And off she jogged, up the hill, past the tractor shed, to the old farmhouse where she, my uncle, Andy, and Molly lived. A minute or two passed, then she reappeared, camera in hand, jogging back down the hill toward us. Now, for many years, Michelle was our family’s only photographer (then Charles came along, but that’s another story), the only person who documented everyday moments such as…well, such as the S.S. Andy’s first voyage. To this day, phrases like, “Your eyes were shut!” and “Hold it right there!” and “Wait, one more!” flow from her as effortlessly as breath. And flow they did that afternoon as Molly slowly sank into the pond. “Oh, Molly, these are great!” she said, ruthlessly snapping away, the camera shutter clicking with rapid-fire efficiency. Molly didn’t appear convinced. So with his foot, Andy gave the boat an obliging push, and away Molly drifted, another five or six feet from shore. It might as well have been a hundred miles. It must have been terrifying standing there in that boat, seeing the inky water pressing in against that thin, diaphanous hull, knowing she was on her way down with the ship as Michelle captured the whole thing on film. Molly wasn’t one to panic, though; she kept her wits. That’s probably why she’s here today. Satisfied at last with the shots she’d gotten, Michelle beckoned Molly back to shore. By now the S.S. Andy had taken on so much water that it sat low and pregnant in the pond, a dead weight not easily propelled. Molly dug in with one of its scrap wood oars and rowed for her life, moving toward us with grim determination, each stroke drawing her a few inches closer to safety, the flimsy boat threatening to come apart beneath her at any moment. I gave her a fifty-fifty shot. It seemed to take forever for her to reclaim the five or six feet Andy’s foot had given her, and even when the boat nudged its way in through the cattails, Molly’s ordeal wasn’t yet over. There were no stepping stones, no safe toeholds. She’d have to splash through the shallows to reach dry land. Out came Michelle’s camera again as Molly took a deep breath and plunged into the pond. I can’t speak for Andy, but I think I half expected the water to burn Molly’s feet away like some kind of caustic acid, that she’d totter unsteadily onto dry land, balancing upon two smoldering stumps. Instead, she scrambled up the embankment, her pants soaked below the knees, her muck-slathered shoes each containing an intact, unburned foot. The only thing burning just then were Molly’s eyes. She glared at Andy, who’d built her such a flimsy boat, and then at Michelle, who’d insisted it would hold her. I’m not sure whether she glared at me, but she probably did just for good measure. Then she stalked off toward the house, squelching as she went, no doubt planning a revenge that included tattooing Michelle’s squeaky-clean floors with pond scum footprints. Later, Andy towed his half-sunken wreck from the water and scrapped it. Not bad for a first attempt, we agreed, but perhaps from now on we’d leave the shipbuilding to the folks up at Bath Iron Works. Besides, we weren’t brave enough to attempt another crossing in one of Andy’s designs, and Molly wasn’t talking to us. It was time to move on to new projects, new ideas. We had a whole farm to explore, after all. Oh, remember how I said I wished I had a picture of my boat? You might be wondering why I didn’t end up with one or two given all the shots Michelle took that day. Well, as it turned out, her camera didn’t have any film in it–a danger of the pre-digital era–so while Molly risked life and limb for that perfect picture, Michelle was shooting blanks, capturing imaginary photos on imaginary film. In the end, though, it didn’t matter. The memories of that day live on, perfectly preserved for all time. I would never pass muster as a vegan; I just love cheese too much. Looking back, it seems I spent half my adolescence – after school, weekends, vacations – slinging the stuff at my family’s (now closed) specialty food store, Tuttle’s Red Barn. Manchego, Gouda, Humboldt Fog, Maytag Blue, Petit Basque, Cabra al Vino, Stilton… Don’t get me started lest I short out my keyboard with drool! Cheese, to me, is a divine combination of nature and nurture, a gift from the gods, wrought by man, to rival the sweetest ambrosia. Of course, I wasn’t always so enthusiastic when it came time to clock in for my shift, but once behind the deli counter, knife in hand, I was a cheese-selling machine. In the spirit of full disclosure, cheese sells itself. I was just the (not so) pretty face that cut, wrapped, and handed it to the customer. But, giving credit where credit’s due, I sent many customers happily on their way with two, three, hell…six more hunks of cheese than they’d intended to buy. It wasn’t hard; all I had to do was make a suggestion or two, let them sample something they’d never tried before, and off they went, hands full, wondering why they hadn’t thought to grab a basket when they came in. Like I said, cheese sells itself. Armed with the naïve misconception that everything is as easy to hock, I took a job selling Toyotas when I moved to Chicago. My first day out on the floor, I leased a brand new convertible to a middle-aged divorcée. No BS, no underhanded car lot tricks. Just me, walking away from the deal nearly $800 richer, thinking to myself, “Now this is how you make a living!” That delusion quickly faded when, for the following three weeks, I didn’t sell a single car and had to make due with the meager weekly “draw” (a base salary of sorts that must be repaid to the dealer when you finally DO manage a sale). I lasted three and a half months at the dealership. Not exactly laying the foundation of a career, and a far cry from selling cheese. Sales, it seems, is more difficult when the customer can’t try a nibble of what you’re selling. It’s been a while since I’ve made a living in sales. Now I moonlight as an inventory planner/purchaser, buying rather than selling, as I chase my dream of becoming a professional writer. So let’s talk about this for a minute… When you think author – or painter, playwright, screen writer, sculptor, actor, dancer, or [insert artistic pursuit here] – you don’t think sales, right? You don’t picture big business, margins, percentages, losses, profits. Neither did I when I got started. All I knew was that I had an idea that needed to get out, characters and events that had to come to to life. For nineteen long months I worked on my story, breathing that life into it, giving heart and soul to a concept that would have remained locked away, lifeless, in my mind were it not for my burning desire to release it, to put it down on paper for whomever wished to ride along with me and my imagination for a little while. 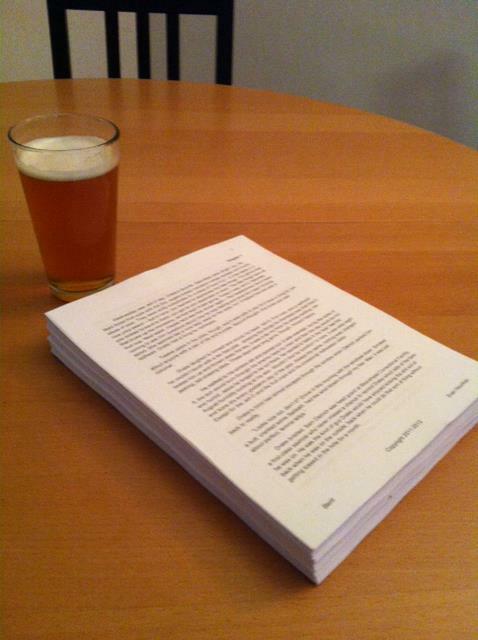 And when I finished my draft almost exactly a year ago (pictured below, printed for the first time, alongside a celebratory beer), I thought the hard part was over. To be sure, spewing 130,000 words is not an easy task. I endured many a day where I actually lost words, editing and cutting as I progressed, chopping fluff. There were days I stared madly at my computer, willing inspiration to strike. And even on the days when I netted words, when I forged ahead, I would often think to myself, “You’re wasting your time. No one will want to read this sh*t.” Still, I trudged on, and in the end, I was thrilled just to have finished such a monumental undertaking. In many ways, I’ve been good at talking myself out of taking risks in life, but in this case, my pessimistic side was fortunately trumped by the part of me that was determined to see this through. Last spring, after nearly six months of revisions, I began submitting my story to literary agents. At first I mistakenly believed that all I needed to break into the publishing world was a compelling manuscript and a winning query letter. And to be sure, NOTHING is more important than a compelling manuscript. But faced with two equally compelling stories, how does an agent choose which one to represent? The answer, it turns out, is simple: the agent chooses the story that has the stronger author platform behind it. They’ll choose the writer who’s taken the time and made the effort to establish an online presence, who recognizes the value in networking and self-promotion, who’s invested in himself and his future. In short, the writer who’s a stronger salesman wins. Sales. Whether we’re talking cheese, cars, or stories, a sale is a sale is a sale. In today’s Internet age, writers are expected not only to be master story-tellers, but also sales and marketing experts. As if it’s not difficult enough to write a novel, we’re now shouldering much of the responsibility that traditionally fell to the publishing houses’ marketing machines. And the learning curve is steep. Social media. Website development. Product placement. Readings. Giveaways. The list goes on and on. The Internet now enables artists to reach a far wider audience than ever before, but with this power comes a whole host of new challenges. Writing the story is the EASY part. Selling it, convincing an agent and editor to pick YOU out of the thousands upon thousands of prospects that pour into their inboxes every day, is much harder. I write, first and foremost, for me. I have stories to tell and find it incredibly gratifying to tell them. But as I’ve said before, I also write for YOU, holding close the hope that one day, you’ll read one of my stories and, for a little while, be transported far from your everyday concerns to a place filled with intrigue and wonder. A place where anything is possible and where dreams (and occasionally nightmares) become real. My hope is that you’ll discover a new favorite! For nearly eight and a half years, I’ve lived 1,000 miles from home. After all that time, New Hampshire is still home in my mind and heart, as I imagine it will always be in many ways. I often wonder what other people think and feel when they reflect on the meaning of home, for I believe my family and I have had a unique and wonderful opportunity to experience a deep sense of connection and belonging to the place we call home by virtue of our tradition and longevity. The farm is not just a place, but rather a member of our family, replete with 380 years of history and memories. It shares its story with me every time I visit, not through spoken language, but by subtler means: a breeze whispering through rows of corn, the smell of freshly harrowed earth, or the crunch of frost beneath my boots as I traverse the pasture below my grandparents’ house. Now, I experience the strongest connection to the place and all its history on my late-night (or early-morning, as the case may be) walks from my grandparents’ to my mom’s, and this always reminds me of Grandpa once saying: “I get my religion watching the sun come up in the cornfield.” I imagine him cutting lettuce or digging carrots early in the morning, dew clinging to the tender leaves, the silence broken only by sparrows and crows taking flight, as he continues along the path that nine generations of Tuttles blazed before him. And in my own way, as I walk alone through the delicate early-morning silence on the farm, I find a religion of sorts as I marvel at the sheer magnitude of all that came before me and that which, even now, allows me to revel in these moments of joy and wonder. When I left NH to “head west young man, head west,” I reached Grinnell with equal parts excitement and trepidation. My application essay (which I lament has been lost) told the story of a boy who loved his home, but who now hoped to bloom into a man by exploring the world in the newer, larger cornfields of Iowa. Indeed, my years at Grinnell altered my trajectory in ways which will, no doubt, continue to manifest themselves throughout my life (If in no other way, at least by allowing me the small pleasure of facetiously responding, “Childhood dream” to the query: “How did you end up at school in Iowa?”). 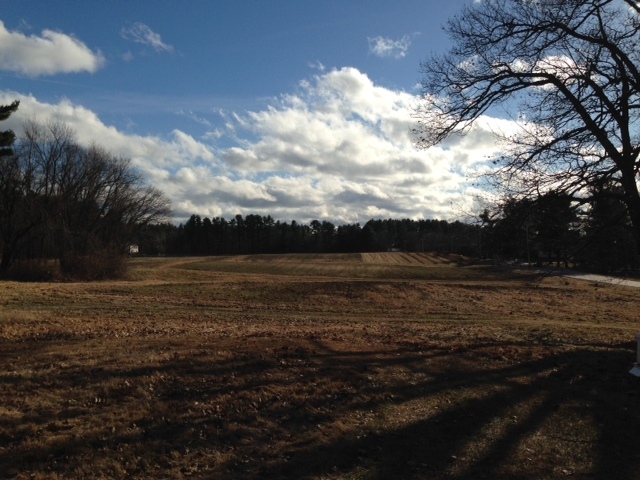 Though my intention always was to return to NH and become involved in the farm and business, it was important for me to find my own place and purpose in the world, to test myself. The ink still wet on my Anthropology degree, I moved to Chicago, the City of Big Shoulders, land of deepdish pizza and those “loveable losers” the Cubs, in August of 2002. What an adventure! Lucy and I found a small apartment, I got a job selling cars, and I imagined that living in Chicago would be exciting for a year or two before I returned home to begin building a life for myself on the farm. Of course, a year or two turned into a few years, which turned into five, which now has turned into the better part of a decade. I’m currently working my 5th job, living in my 5th apartment, and (phew!) only on my 2nd girlfriend, but Chicago has, over the years, become a familiar and comfortable place to me. It’s become my adoptive home as I’ve built a relationship with Marta, cultivated many close friendships, and started a career. In October, 2009, I learned what I might have suspected for at least a year or two: that Mom and Uncle Will would, born of necessity, be listing the farm and store for sale within 6-12 months if business didn’t stage a dramatic about-face. We had all known, I think, that a tipping point was approaching, but this notion only became “real” to me when Mom and Will sat me down one afternoon in the tractor shed to tell me just how bad things had gotten. My mind churned constantly for the next few months trying to think of something – anything – that would forestall the loss of the farm and the traditions our family has built upon it. No small amount of that time was spent second-guessing myself, asking myself what might have been different if I had returned or even if I had never left. Would I have been able to prevent this? Could I have saved the farm? There are some questions life puts to us that may never be answered – questions like these. I will never know if I could have made a difference, but I will always wonder. As I sat at Grandpa’s bedside on a cold December evening in 2002, looking upon the shell of a man who had always been a hero to me, I spoke to him privately of how important the farm was to me, how fortunate I felt to be part of something so meaningful, and how proud I was to be his grandson. That night, I promised him I’d return one day and find my place as part of our family’s nearly four-century tradition. This was not a commitment I took lightly, but I knew then, as I’d always known, that my purpose and future were intertwined with the ancestors my grandfather would soon join. Grandpa died later that night, and now that the sale of the farm is inevitable, I will never have the opportunity to fulfill the promise I made to him. I am certain, though, that Grandpa will forgive me, because in spite of the concern he undoubtedly felt about the farm’s future, I know that his children and grandchildren’s happiness was more important to him than the continuation of a tradition which was already fading when he passed. 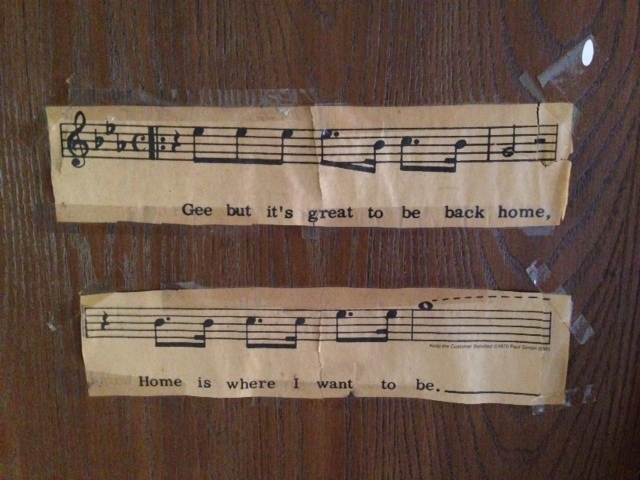 A yellowed newspaper clipping on my old bedroom door reads: “Gee but it’s great to be back home…home is where I want to be,” a snippet from an old Simon and Garfunkel song hung there by Mom when I returned from St. Paul’s in 1993, a scared and homesick high school freshman. I’ve lived 1,000 miles from home for eight and a half years, but the farm will always be my home whether the name “Tuttle” is on the deed or if, after this incredible run, a new name is signed on the dotted line. We have all made lives, some on the farm, some far from it, but because of our shared origins – our home – we will always be a part of something much larger than ourselves. And that can never be taken from us.